Happy Landing Farm Plat 4 residential building sites are conveniently located north of Wabash Avenue west of Koke Mill Road. Choice single family and duplex building sites sites are currently available. The minimum home size is 2,100 square feet. 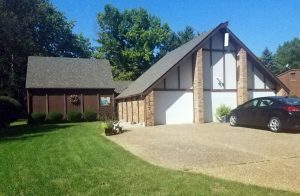 Lot prices range from $32,000 to $37,000. Happy Landing Plat 5 offers commercial property for sale. Existing commercial development includes Town & Country Bank; Prairie State Bank; Friar Tuck Beverage; Heyl, Royster, Voelker & Allen Attorneys; Steckel-Parker Architects; and the Real Estate Group. 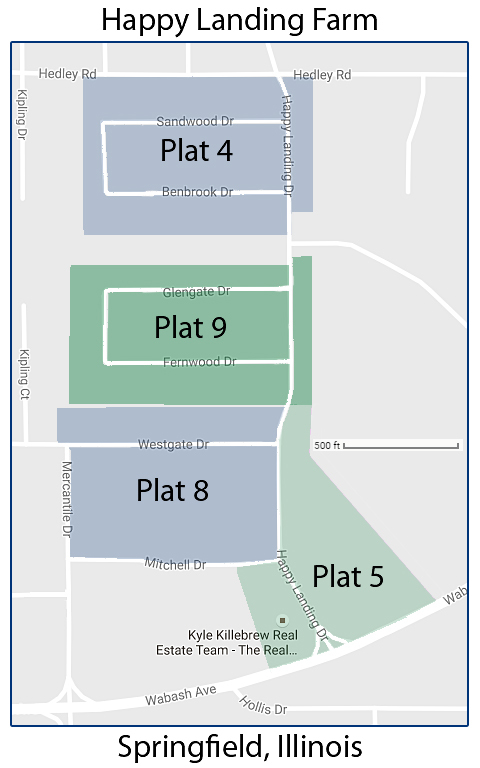 Plats are zoned S-2 Community shopping and office district. Conveniently located west of Koke Mill Road and Old Jacksonville Road, Kreston Place residential building sites include duplex and townhome building sites. Residential building lot prices range from $60,000 to $64,000. Happy Landing Plat 8 offers commercial property for sale. Conveniently located close to interstate 72 and near heavily traveled Wabash Ave, these sites are buffered from direct traffic yet adjacent to residential development and near other commercial, retail, restaurant and office development. Lots are zoned S-2 Community shopping and office district. Happy Landing Farm Plat 9 residential building sites are conveniently located north of Wabash Avenue west of Koke Mill Road. 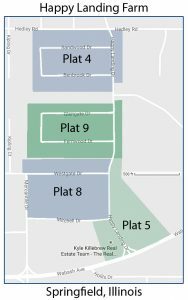 Kreston Place Plat 6 is now open, and includes single-family residential building sites and one corner duplex site.